All images courtesy of Peter Jensen. As I couldn't be at Vancouver Fashion Week on day 4, I went to the venue earlier in the day to look at some of the collections backstage and talk with the designers personally. It was actually great to hear them enthuse about their collections and to see the incredible detailing up close. I did not manage to find all the people showing on Saturday unfortunately, so am limited to choosing from those I did talk with. Here are 3 from the day 4 slate. There will be a separate article on designer Adriana Santa Cruz as the back story on her collection is truly special. Hopefully I can get that up later today or by Monday morning at the latest, so be sure and check back. NOTE - Again I want to make it clear that I am only writing up a few designers each day that caught my eye for one reason or another. It's always hard to select who to cover as every designer puts their all into creating a show for the audience. Every person looks at fashion differently, so I encourage you to go to the VFW's list of designers with website links and check out the other brands that showcased each day. There's some amazing work not covered here to surprise you. Other writers are also covering other designers - so check out the listings on the VFW Facebook page. LUVON designer Liu Lu was born in Bejing and has studied fashion both in Paris and at Parsons in New York where she earned the Golden Thimble Award. After working a while with celebrity stylist GK Reid, she decided to leave a promising career in the United States and returned to China to launch her label. LUVON is designed with the concept of promoting the new age women. They are sophisticated, yet giving. The designer shared, "It's not about outer beauty anymore, it's about inner beauty and spirit - how loving you are." Her label is known for classic elegance and playful sexiness. F/W '13 is titled "Reserved." The tailoring in particular is exceptional and the draping beautiful. I enjoyed being able to ask Lu her favourite garment this season and it's the ivory coat second from right. Those folds below the belt are actually pockets. Kudos to the designer for the deceptive way they flow into the lines of this coat. I agree - this is a stand out piece. Istanbul designer Hatice Ipek Tohumcu caught my eye at the opening gala with her gorgeous gown embellished with laser cut leather. In addition to a fashion degree from F.I.T, she has an MBA in Marketing, a BA in Business administration and is an highly skilled colorist who teaches at the university level to a wide range of disciplines including students in Architecture and Interior Design. Silhouettes are body conscious and often sculptural with a palette that showcases her expertise in this field. There were 2 collections presented on the runway this evening. The first was luxury leather sportswear. Intricate details such as embossing and laser cut appliques created finishing touches that took this line to a whole new level. I particularly liked the deep red/black coat and dress on the far right below. It incorporates all the elements mentioned above in one single, beautiful package. The second focus was high end red carpet looks. The looks had great proportions and the designs sported just the right amount of intricate detailing - not too little, not too much. The black dress 2nd from left below has a lot of detailing which gives it that extra pizzazz, but in the same colour as the dress so it doesn't overpower. I also love the lacey gold leather inset in the back of shorter dress 2nd from right below. Finally, who wouldn't love to be seen on the red carpet in the black/gold dress with net train on the far right below. Artistry and great technical skill walk hand in hand here. I hope Tohumcu will be returning to Vancouver Fashion Week for future shows as I truly love her collection. Although we had to work through an interpreter, I was very privileged to have the chance to talk with Roksolana Bogutska backstage and view her designs close up. There were so many intricate details incorporated into her garments that would have been hard to fully appreciate on the runway. I came away with a new level of appreciation for her work. Based in the Ukraine, Bogutska is a blend of opposites that she combines with great skill - elegant luxury and bold modernity, traditional Ukrainian motifs and modern fashion trends, new fabrics and 100 year old antique panels. 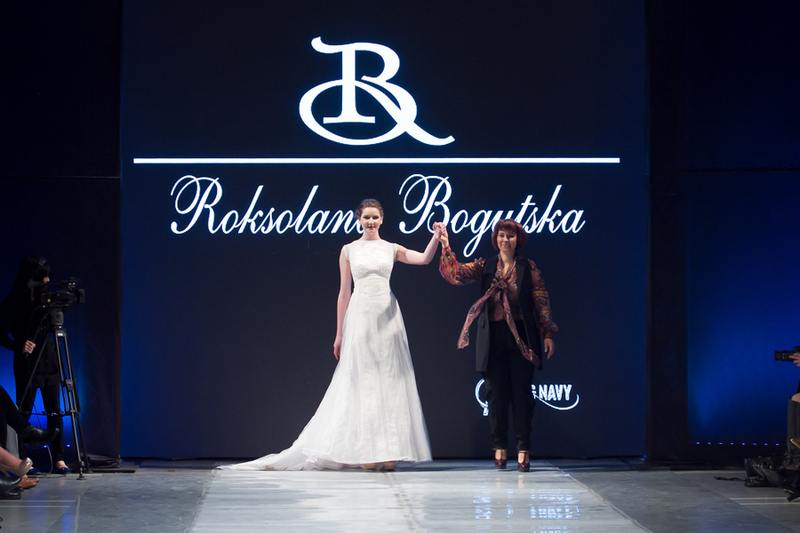 After graduating from Lviv College of Fine Arts, she launched her first collection in 1998. Now one the Ukraine's top designers, her garments have been worn at inaugurations, on stage and by celebrities. Leather, fur, wool, silk and cotton provide the raw materials for this line. All fabrics are custom made in Italy including original prints with traditional motifs. Traditional embroidery was incorporated into designs in a way that blended well into the modern look of the garment. An example - one luxurious gown had a small, colourful embroidery panel tucked in beautifully at the waist that hinted at a traditional apron. I particularly want to mention the white wedding gown shown in the image at the beginning of this article. There just was no way a photo could capture how much work went into creating this gown. The centre front was inset with a 100 year old antique panel of traditional embroidered white cotton. There was a slight colour variation in the laces used adding a subtle depth to the white palette. From afar it looked classic and simple, but up close you could see how much intense work went into this gown. Kudos to the designer. So ends another day at Vancouver Fashion Week. Only Sunday night is left and then we have to wait for a whole new season. I so grateful to the international designers who make the trek to Vancouver to give us a glimpse of what is happening in the rest of the world. I hope they will all return next season!